Artist rendering of $6.5 million plan for Isla Blanca Park. SOUTH PADRE ISLAND — The county’s best park is about to become even better. 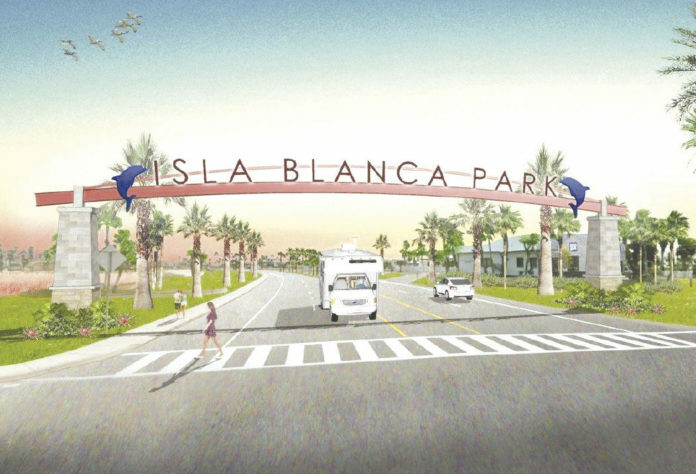 A $6.5 million project for Isla Blanca Park will add a new amphitheater, a multi-purpose building and a parking lot with 230 spaces in the Dolphin Cove area where the boat ramp is located. Funding for the project at the South Padre Island park comes via the county’s hotel-motel venue tax. “It’s going to be a beautiful addition to the Cameron County parks, to Isla Blanca Park,” County Parks Director Joe E. Vega said. Isla Blanca Park, with its mile-long beach, fishing jetty, pavilions and 600 RV sites, attracts more than a million visitors a year. Construction is expected to be completed and the additions ready for visitors by late spring or early summer. Vega said a notice to proceed has been granted to Noble Texas Builders of Brownsville, and he said the construction firm will begin mobilizing equipment to the site this week as they build the multi-purpose building and the amphitheater. “We’re hoping to attract different types of events to the venues, like theater arts, music, school groups and band concerts at the multi-purpose building at the amphitheater,” Vega said. The amphitheater, multi-purpose building and the new parking lot will be located just to the east of the current boat launching site, with the amphitheater right on the water overlooking Brazos Santiago Pass. Vega said food truck vendors will be located at the amphitheater, and that the multi-purpose building will be available for special events including weddings, meetings and conferences. “Isla Blanca Park is the crown jewel of the Texas gulf coast,” Vega added. “This place offers an array of amenities, like jetty fishing, we have a pristine beach, we have two picnic pavilions, and we have trails and a boat launch area there at the park. “We have right now over 600 RV sites there at the park,” he added. “And you know we have concessions there, we have Schlitterbahn water park, we have a full-service marina, we have great dining and restaurants in this park, we also offer water sports at the park such as parasailing, dolphin watching, bay fishing and offshore fishing. “That’s an array of amenities,” Vega said.